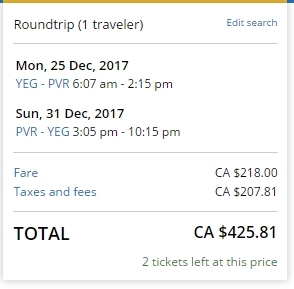 United Airlines is showing some last minute flights over the Christmas holidays from Edmonton to Puerto Vallarta, Mexico for a pretty decent price of $425 CAD roundtrip including taxes. The flights have 1 stop each way, in Denver. edmonton, yeg, flight deals, puerto vallarta, mexico, pvr, united airlines and north america.